There are over 7,000 barbecue teams in America and as many team names. What’s in a team name? Sometimes it is a chance coincidence that’s the genesis of a team name. Or, it may speak to something deep and emotional within the head cook. Some, like “Slap Yo Daddy BBQ”, was by accident after a co-worker saw the movie “The Bucket List“, featuring Morgan Freeman and Jack Nicholson. I was challenged by co-workers to complete a stretch goal to compete in a KCBS barbecue contest just for kicks. I needed a team name when I filled up the application form to cook just one contest to get her off my back. My team name “Bucket List Barbecue” was rejected by her and my-coworkers and I was asked to use a one-time-throwaway-team-name “Slap Yo Daddy BBQ.” It didn’t matter to me what my team would be called as I would not use it again after my first contest. The rest, as they say, is history. My better half and grand champion pitmaster Donna also has a team name. Here’s her story . . .
As the head cook of Butcher’s Daughter BBQ, most people assume that the “butcher” in my team name refers to my father. In fact, both of my parents are retired butchers. My mother worked as a seamstress at Simmons Mattresses for decades. But a change in job tasks required her to lift mattresses resulting in a hernia, a surgery and her quitting her job. She spent the remaining years of her working life in my Father’s butcher shop, Don’s Meat, in Oakland. I named my team to honor my parents and their journey. Most have never heard about how my Father started his life as butcher so I thought I would share his story. I interviewed my 83 year old father a few days ago and was amazed by how much I didn’t know. 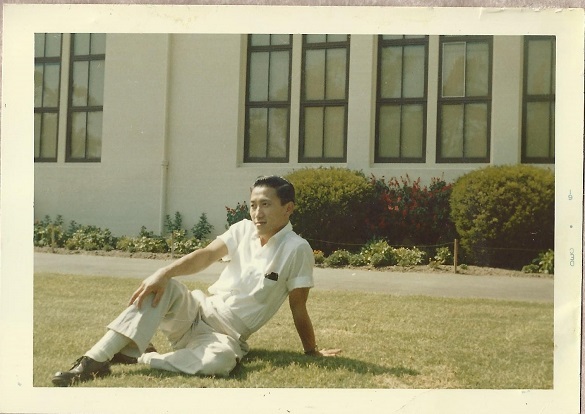 My father, Donald Fong, immigrated from Zhongshan, China, to the U.S. via Angel Island in 1955. When he arrived, he enrolled himself at Oakland Technical High School, the Alma mater of Oakland A’s legendary base stealer Ricky Henderson, Hollywood superstar Clint Eastwood, the inimitable Pointer Sisters, and “Love Boat” bartender actor Ted Lange. Who would have imagine that Isaac grew up in Oakland? My Dad didn’t speak much English when he immigrated. His sister Janet, who had already immigrated here, helped him with his English studies. While in high school, he became friends with someone who worked at Liberty Market, a local store in Oakland Chinatown owned by three Chinese Hawaiians. When the friend bought a new car, he gave Dad his old blue 4-door Chevrolet. My father was thrilled by this gesture of American generosity and so were his high school friends. He was an instant celebrity at high school. Dad was a few years older than everyone else in his class but he valued an American high school diploma. He understood the importance of education and that value carried onto me. My parents were proud when I graduated with degrees in Biochemistry and Physiology. Dad studied hard too, working after school as a bus boy at the fancy Edgewater Hotel near the Oakland Airport. Wearing white cotton gloves, he bused tables at the opulent restaurant. He couldn’t believe all of the fancy meals they eat in America. Later, he decided to work with his friends at Liberty Market. He got the job because Janet’s cousin, Kew Chan and his buddy Jimmy Fong, already worked there and liked my young father. He was hired as a meat purchaser. A purchaser traveled to the meat wholesalers in the area and purchased large cuts of meat. Many wholesaler companies were owned by German immigrants, who were already trained as butchers before arrival in America. Schaefer Meats on D and 98th Avenue sold mostly beef while East Bay Meats on 4th and Alice sold pork. 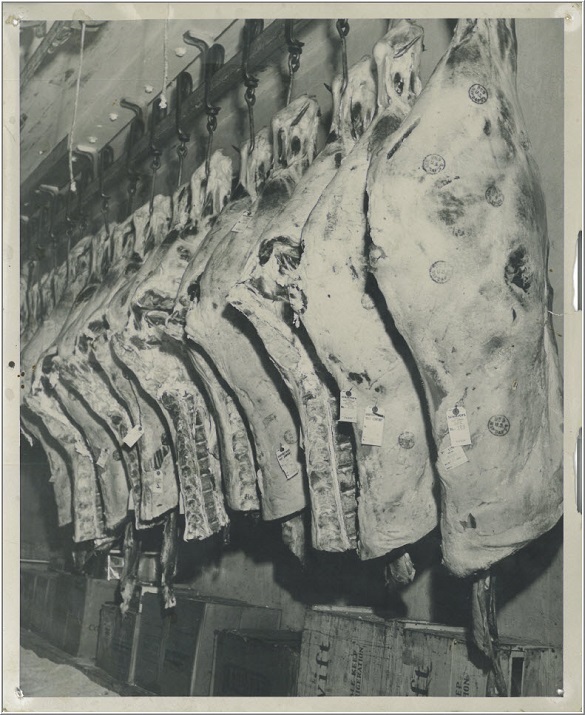 Wholesalers would hang a half or quarter of a steer and aged them for 1-2 weeks in the cold room. When my Dad saw a quarter he liked, he would claim it by stamping it with his Liberty Market stamp. No one else could purchase it once it was stamped. Back then, a quarter steer cost about $70. Liberty Market would sell about two steers a week so it kept my Dad pretty busy. He would do the same thing East Bay Meats. He worked there for six years and learned how to cut down a 500lb dressed steer into 250lbs of sell-able product to Chinese customers of Oakland Chinatown. During my Dad’s time at the Liberty Market butcher shop, a representative from the Butchers Union Local 120, approached my father and asked him if he belonged to the union. My father said no. The representative informed him that he couldn’t work there legally without belonging to the union. The union initiation fee was $175. My father couldn’t afford that princely sum. Thankfully, his boss agreed to pay for my dad’s membership fee, and my Dad agree to pay $20/month in union dues. Belonging to the union had its advantages. He was guaranteed a certain salary and part of his union due would come back to him after retirement, as it does now. The president of the union, Don Finney, at the time was fond of my father and accepted him. When I was a little girl, we ran into the President on occasion in Oakland and my Dad once pointed out the red socks he wore. My father liked his red socks. Back then, the union regulated when you could work and when you couldn’t. Butchers weren’t allowed to cut meat after 6pm. The unions had a lot of power. My dad says no one cares much nowadays if you are part of the butcher union or not. My father went to Tech too. It was a lot earlier before the war. I saw that picture and new it was familiar before reading the caption.